The extent to which I am familiar with Indian culture is that which I’ve seen in movies like “Bend It Like Beckham”. Last year, though, I found a blog called Rainbow – The Colours of India hosted by my blogger buddy Sanghamitra Bhattacherjee (Mukherjee). Sanghamitra is an avid traveler and photographer who captures some of the most beautiful images I’ve ever seen. She has become my personal version of National Geographic. 🙂 I’m in awe of people who can just pack a suitcase and hit the road (or skies, or water) without reservation or hesitation. I’m the consummate homebody, so I live vicariously through those brave, happy-go-lucky souls. Sanghamitra’s photos of the bright colors of India, along with her posts last Fall on Diwali (popularly known as the “festival of lights“), inspired me to try my hand at a table that celebrates the festival which generally begins in October/November. This Diwali-inspired tablescape is by no means “traditional” or “authentic”, but it is my attempt to capture the colors, smells, tastes and feel of a country I admire but will never see in person. I think it fits right in with Cuisine Kathleen’s “Destination Challenge” this week! An abundance of rich, bright colors starts with the hot pink overlay. 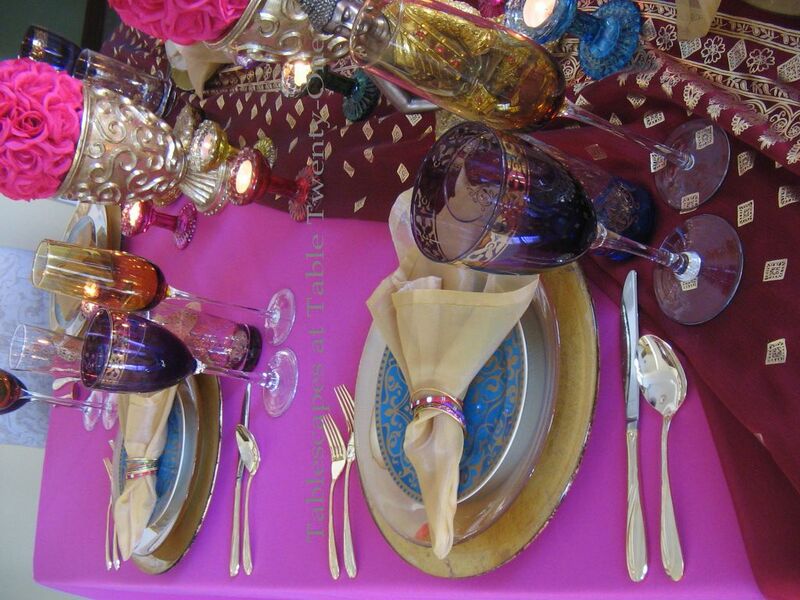 Each place setting begins with a gold-leafed glass charger. The amber glass dinner plates are from Pier 1, and the 222 Fifth “Ornamental Scroll” salad plates were a Home Goods find a couple of years ago. 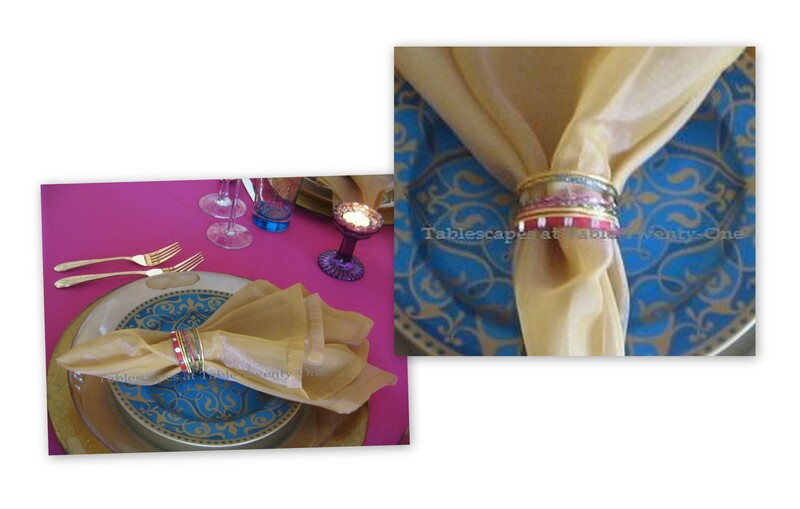 Sheer gold napkins from Pier 1 are cinched with tiny child-size bangles purchased at a local market called Namaste India. It’s a fun place to shop with lots of different foods, clothing, jewelry and other items unique to the Indian culture. 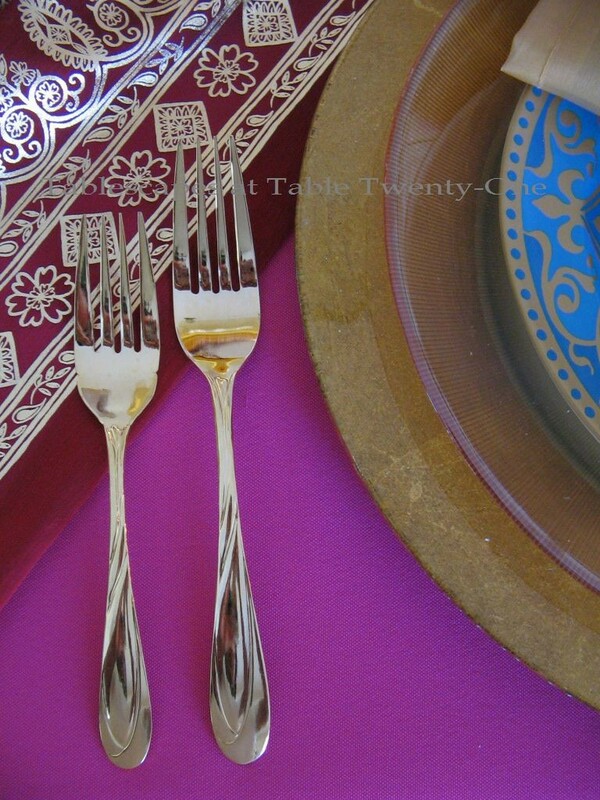 Shiny gold flatware works well against the brilliant colors. A combination of opulent glassware includes gold-embellished tumblers that I bought at TJ Maxx in several different base colors (purple, red, turquoise) including the green pictured here. 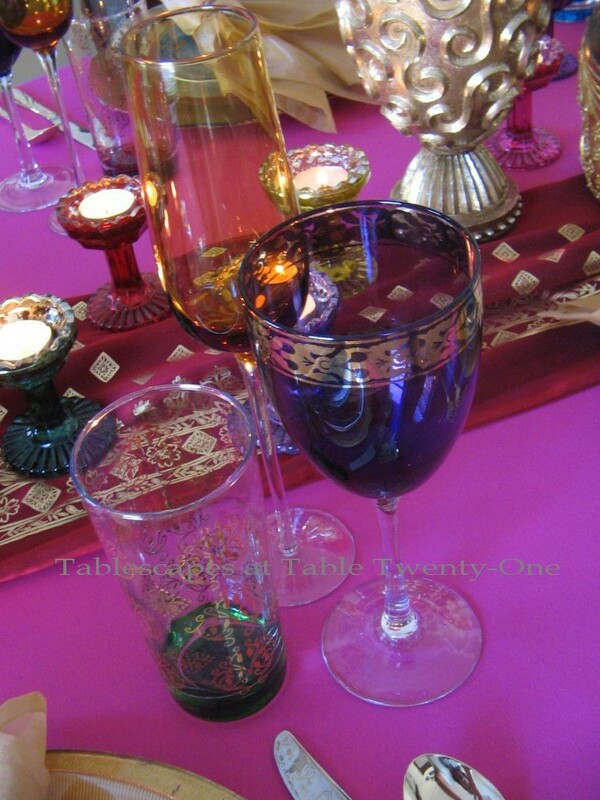 The purple gold-rimmed wine glasses were a Pier 1 find many years ago, and the leggy amber flute is from World Market. I love every opportunity to mix and match glassware! The centerpiece that extends the length of the table is a mix of various components. 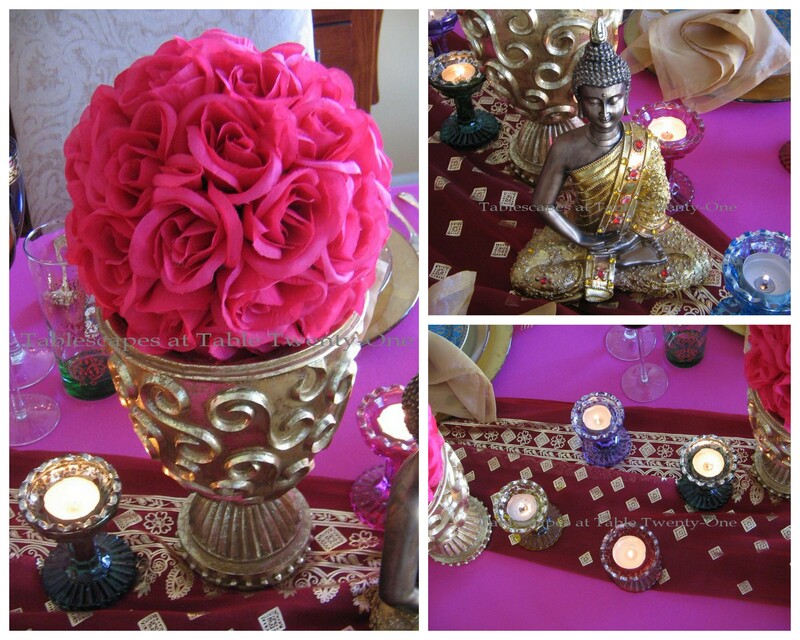 Hot pink rose balls sit center stage atop a gold vase. Flanking the vases are graceful red gem-studded gold Buddhas that I found at Jo-Ann Fabric & Craft store a couple of years ago. 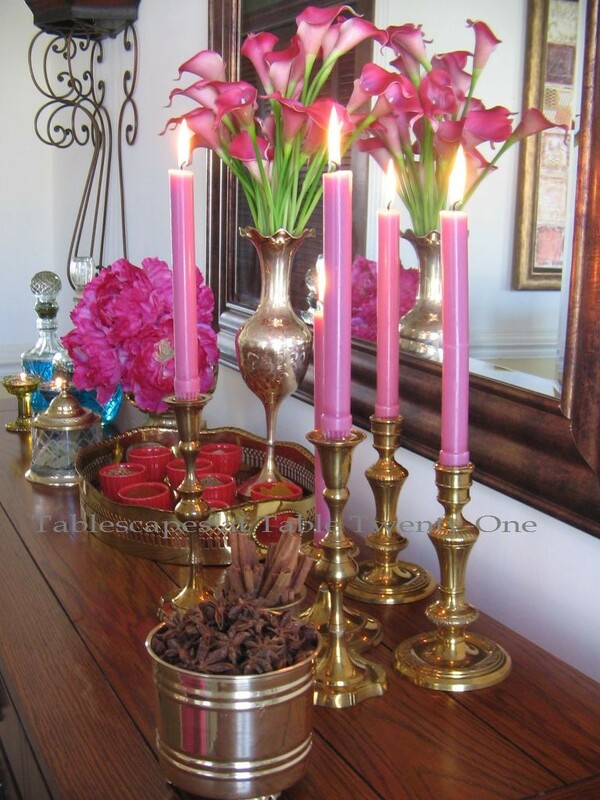 Multi-colored glass votive holders dot the rich swath of red & gold silk fabric placed diagonally and allowed to puddle onto the floor for dramatic effect. The buffet behind the table boasts colors that complement in the flowers, candles and other details. 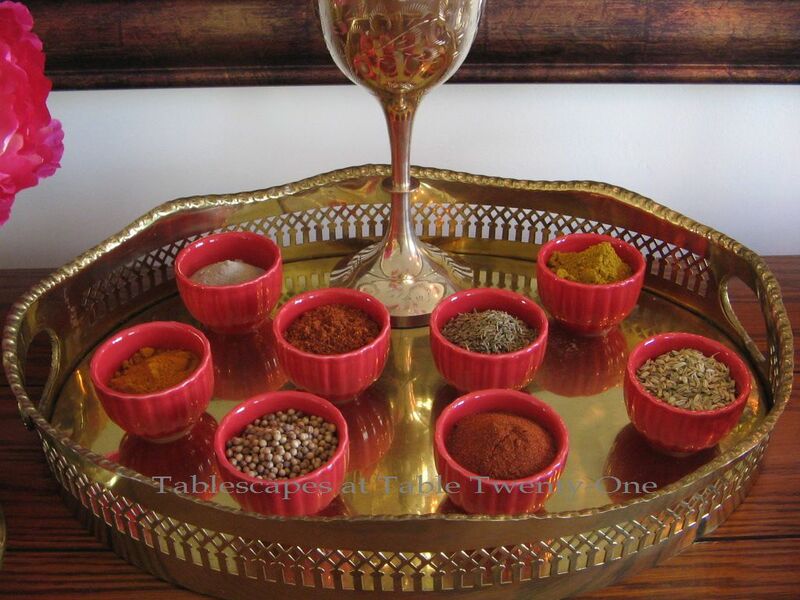 Spices commonly used in Indian cooking are as beautiful as they are tasty. Coriander, cumin, curry, fennel, ginger, mustard seed, paprika and turmeric are just a few of the wonderfully fragrant spices that add zesty flavor. Cinnamon, star anise, and fragrant bay leaf are other popular spices used in Indian cooking that produce a special flavor. Finish off the evening with a fabulous libation made with blue curacao liqueur. I carried the hot pink color to the buffet via a small arrangement of peonies and a more imposing bouquet of calla lilies in a brass vase from India. I enjoyed my week off and got a lot done, but I’m glad to be back with all of you in Blogland! Please join me at Cuisine Kathleen’s for “Let’s Dish!” and at Susan’s place for Tablescape Thursday again this week! So elegant. Just amazing how easily you create the perfect table. You didn’t take a long break. I would still be resting. Fabulous!!! My daughter-in-law is Indian and I’ve always wanted to put together a tablescape for her. I’m drawing inspiration from you. 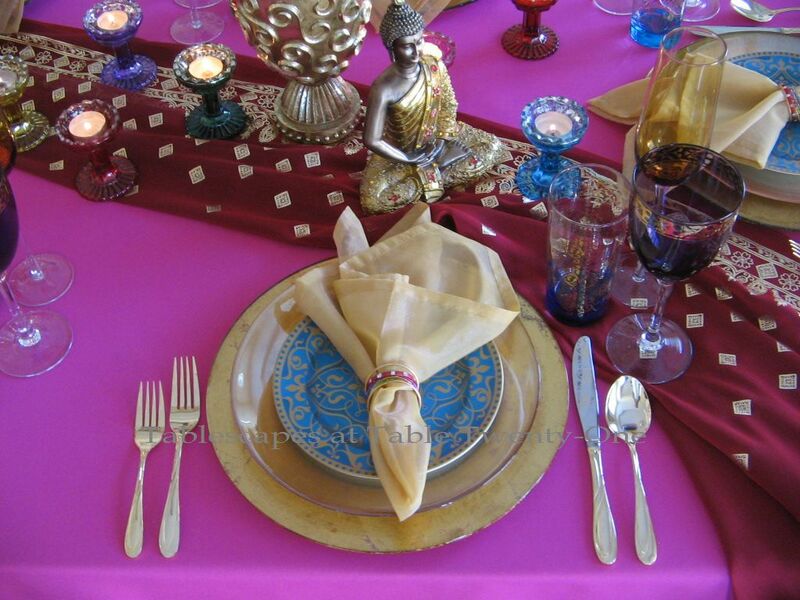 Oh Alycia, what a gorgeous Indian tablescape! The colors and textures you used are so perfect. I love the buffet table, too, with all the spices. That silk fabric tumbling to the floor may be my favorite part. Oh, but I love the rose ball centerpieces, too. You think of everything, my dear!! Very nicely done! I love the richness of the colors. Beautiful calla lilies. Well, you are back with another gorgeous table…While viewing the pictures, I can actually hear the music of India….you set an amazing tone of bright, lavish colors all the while feeling a sense of tranquility. 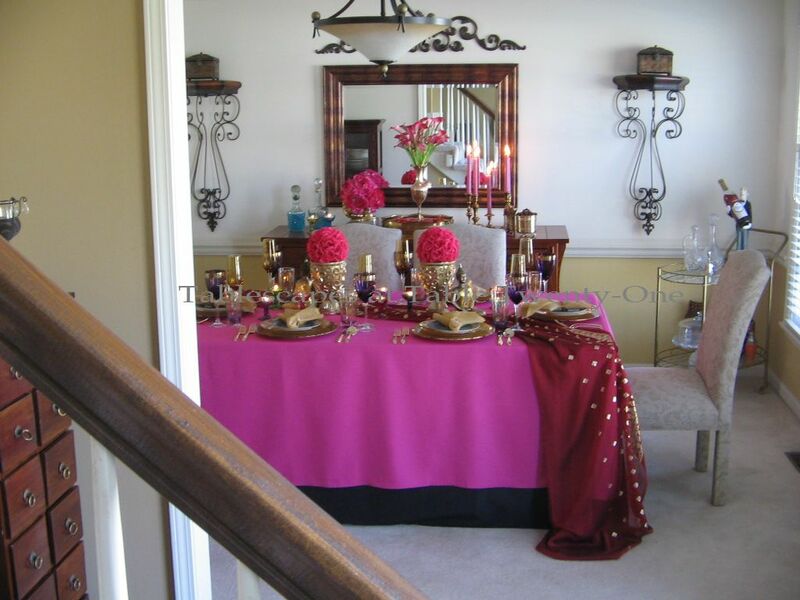 Love the way the runner drapes across the table and flows to the floor…beautiful Alycia!! Welcome back…hope you had a great time of fun and relaxation! Why is it that when I just finish the most perfect comment, it’s gone??? arrrgh. Great job with the tablescape. The colors were perfect for India! Beautifully done. Every little detail, perfection. I can almost smell the spices. 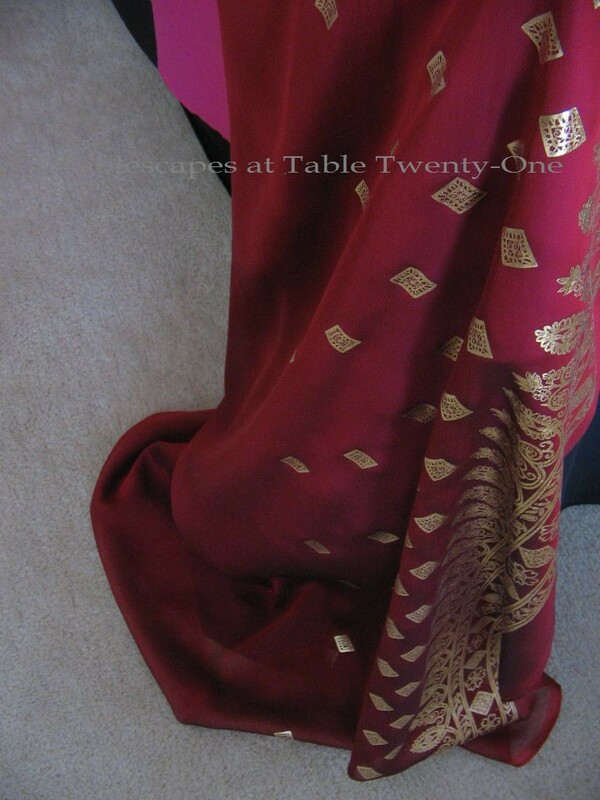 How clever to drape the fabric across the table like a beautiful sari. Oh, I so love this table!!! All of it’s bling and the spices and every little detail. And of course those salad plates I told you months ago I wish I hadn’t passed up. Loving these colors and textures Alycia!! Gorgeous table! Alycia you are such an artist!! You have carried out these colors to such a beautiful end. Your table is absolutely gorgeous! I remember those posts from that blog last year too, and I was so awed by them. I have to say that you accomplished something equally stunning with this table! When I looked at the first picture, all I could think of was a beautiful Indian woman draped a dress (sari? I can’t remember what they are called) of rich and vivid colors. The bangles are the perfect touch as well, and using the spices almost made me smell the fragrance. It’s all really perfect. It’s official. This is my favorite Alycia table. Until I pick another one. I’m, as always, DELIGHTED to be here. Waaaahhh… this is me! U know so much I love shocking colors *giggles and the treasures on top of your table are always one of a kind, my kind but I can’t find or afford to have them back home in Stockholm. TY a mill for sharing, at least I can dream beyond. Happy mid-week dear Lady and GB to all. I love the richness of everything on the table. You did a very fine job ! This post has my conviced that there isn’t a style or theme that you don’t excel at! 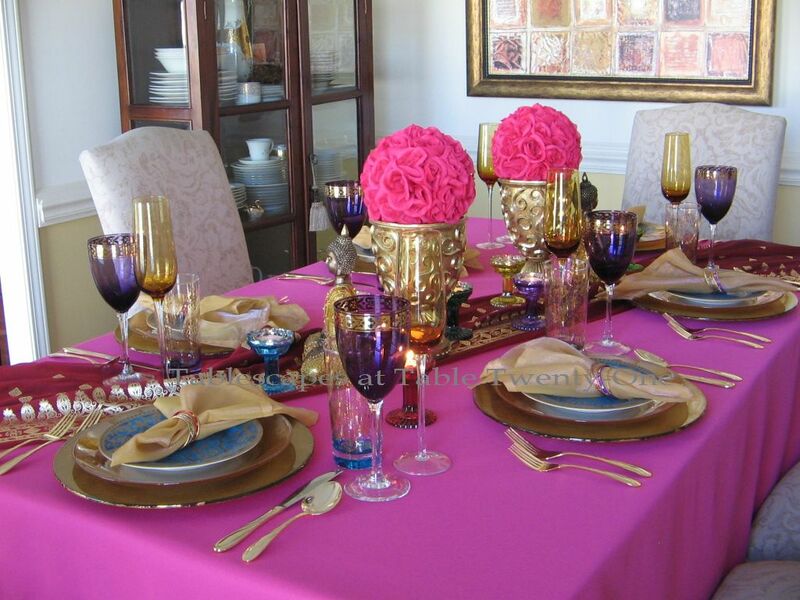 I love these bright rich colors and the tasteful combination of gold. This interpretation is just brilliant. Absolutely beautiful! I love all the bright, vivid colors! Beautiful Alycia! This is so unique and exotic. I love the eclectic color combination–you have such a great eye! Hello Dalai! Gorgeous! Drama, bling, color, you have it all! 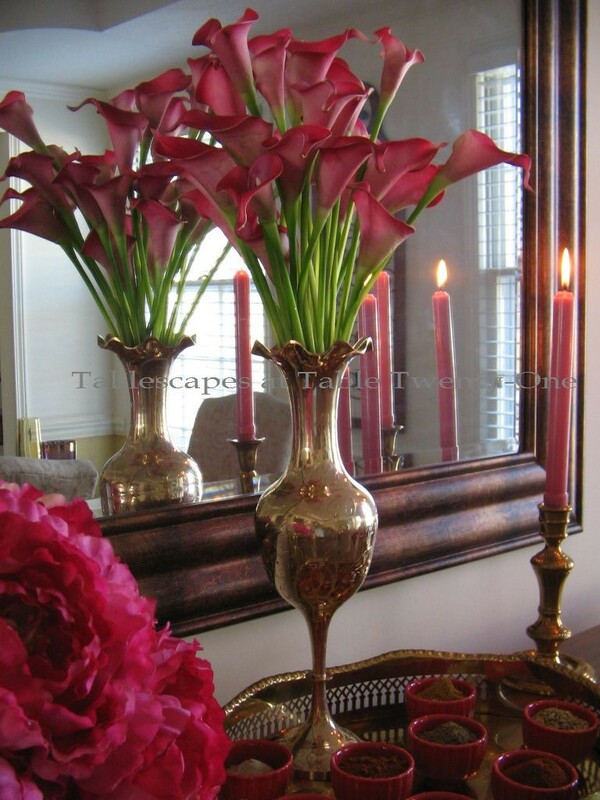 Calla lilies, just wonderful! I just bought some to plant, same color. What a great idea on the child bracelets, love it! Thanks so much for the trip to India and linking this stunning table to Let’s Dish! Welcome back! Your table s do colorful and festive. Love exotic things. Cala lilies are so beautiful and graceful. Your choice of a child’s bracelet is wonderful . I always enjoy using different things to slip in the tablescape. How wonderful that you have been able to connect so well with another blogger half way across the world to be inspired to make such a beautiful table!! Sometimes this technology we have amazes me at the things we are able to share, thank you Alycia for letting me travel with you to such a colorful, exotic, cultural trip! 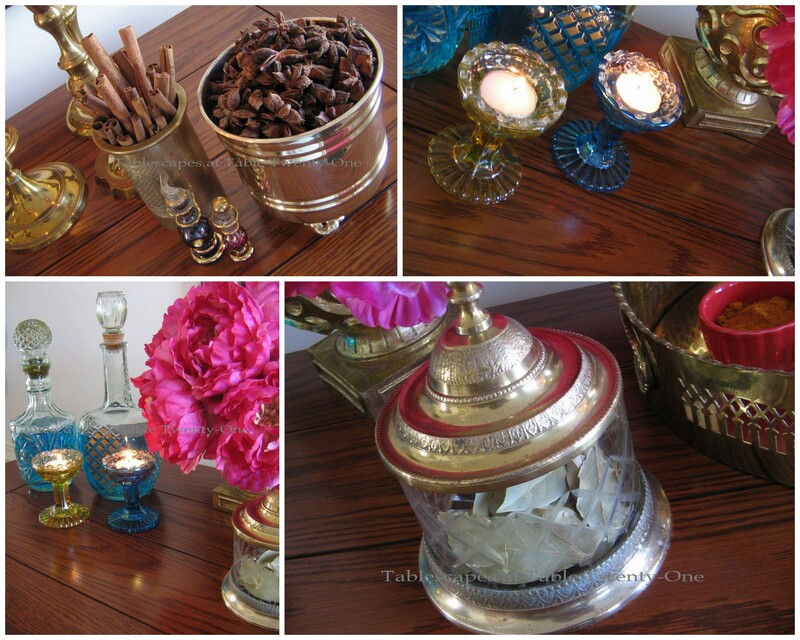 Og goodness, what an amazing Indian tablescape, my goodness Alycia, you managed to come back in a big way with this incredible table and no less from your blogger friend from so far away in the world!! Everything about this table is stunning, from the dishes, table linens and gorgeous flowers! Thanks for sharing, I might go look again! Glad you’re back my sweet friend. Amazing Alycia! You really captured the color and design elements beautifully! Very well thought out! Wow, wow, wow! The colors and textures of this creation are incredible. How do you do it time and again? I am a sucker for , and it appears in multiple places in my Houston house. I’m told the colors of India are spectacular and you have definitely made it seem so. Thanks once again for this stunning tablescape. It is an incredible creation! You have captured the whole ‘Indian Element’ so perfectly and beautifully!! 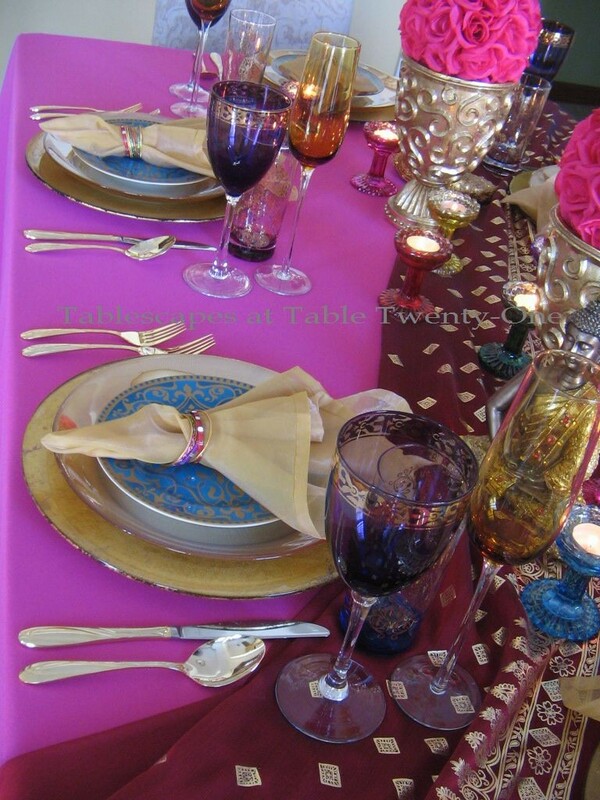 LOVE those bold colours, dramatic linens, elegant glassware and gorgeous flowers. Those cute bangles and the spice try are showstoppers. This table is simply amazing and I am speechless! Sorry, I am late here as my dad is not keeping well. So very infrequent on the blogosphere lately. Have a great week ahead my friend. 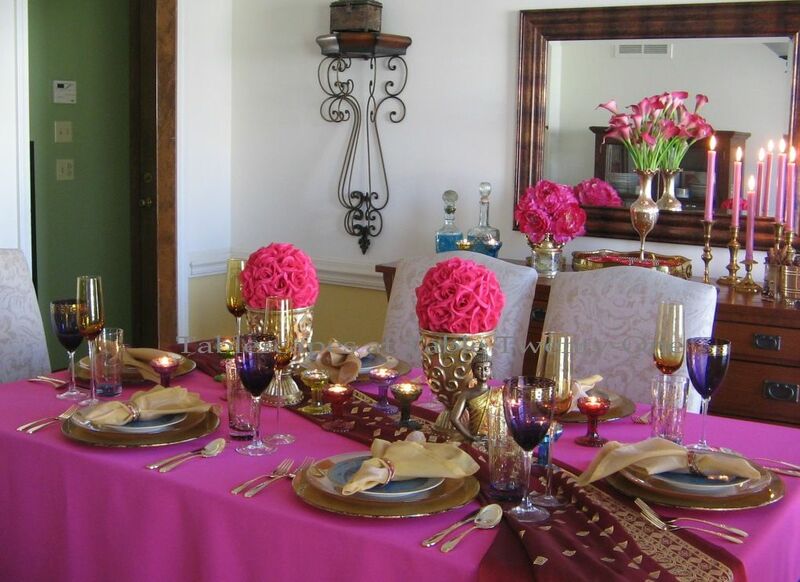 Beautiful table, I think you nailed the Indian culture with your bright colors, the pink tablecloth is a big punch of color. Love the china and stemware, lots of touches that all say Indian to me.